Chicken Enchilada Pasta is a hearty, easy and delicious weeknight meal, made with just a few ingredients and ready in 30 minutes. 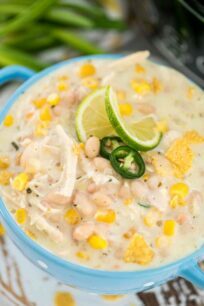 We love quick and easy Mexican inspired recipes like Slow Cooker Tortilla Soup and Chipotle Chicken Nachos. 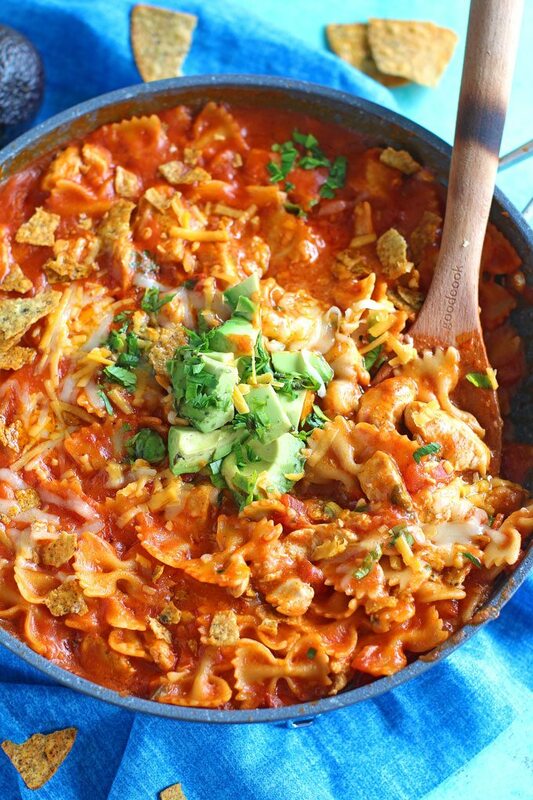 Chicken Enchilada Pasta is one of the easiest and flavorful meals you can make. This pasta is ready in 30 minutes and is packed with tender chicken meat, enchilada sauce, pasta and lots of cheese. This delicious meal can be easily made for a crowd. You can use whole grain or whole wheat pasta if you want to make it more nutritious. 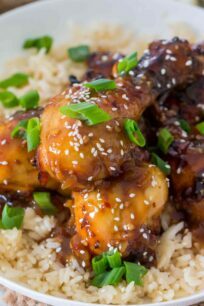 This meal is perfect for busy families, as it requires little work and time. Creamy, cheesy, and flavorful, this 30 minute meal is a life saver! Leftovers are also incredibly tasty. Bursting with flavor and coated in the most delicious cheesy and slightly spicy enchilada sauce. 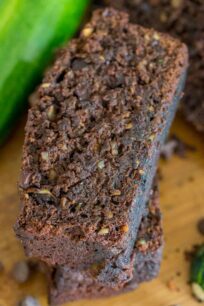 For vegetarian version you can use chickpeas or beans. 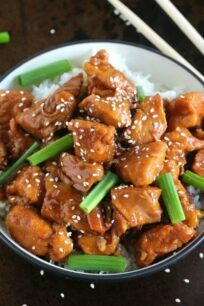 Can be made with other meats as well: turkey or beef are delicious options. 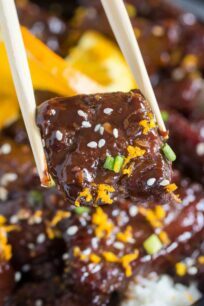 Use quality meat, because it will have a richer and better taste, which is needed for this recipe. I used diced tomatoes with green chilies to add some heat to the sauce. For a spicier kick, you can add Tabasco sauce or chili pepper flakes. Using fresh garlic is preferable, because it will add a nice flavor to the sauce. 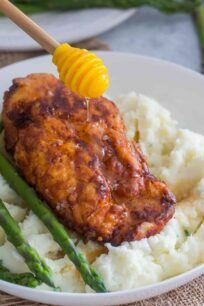 Cook the chicken to a golden brown perfection, if you prefer a crispy texture; I personally like mine tender and juicy in this recipe. Make sure you don’t over cook the pasta. Since you want it al dente, as it will keep cooking in the sauce afterwords as well. When it comes to the cheese, I like to freshly grate mine, because it is definitely more creamy that way. You can also use a Mexican cheese blend if you are in a hurry. What is Chicken Enchilada Pasta? 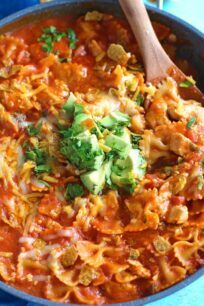 Chicken Enchilada Pasta is a quick skillet dish flavored with a thick and rich homemade or store-bought enchilada sauce, and topped with various cheeses. To freeze, transfer the mixture to a buttered 9-by-13-inch freezer-to-oven baking dish. Cover tightly with aluminum foil. Freeze for up to 3-4 months. When ready to serve, bake frozen and covered with foil, at 350°F, for 30-40minutes. Or thaw overnight in the fridge and heat in a skillet or microwave. Add water to a medium pot and bring to boil. Cook pasta al dente, following package instructions. Add olive oil to a large skillet or dutch oven and heat over medium - high heat. 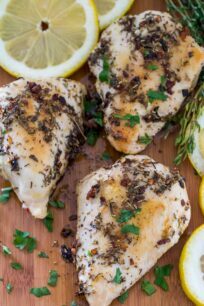 Season chicken breasts with salt and pepper and add to skillet. Cook for about 5-7 minutes, stirring with a spatula. Stir in minced garlic, diced tomatoes with green chilies, enchilada sauce and tomato sauce. Stir until Add in cooked and drained pasta, stir to combine. Add in cheddar and American cheese and stir until melted and combined. Take skillet from heat, top with extra cheese, fresh chopped parsley, avocado and crushed corn chips. 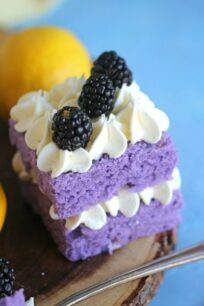 Your photos are making me so hungry!! It looks so good! Oh wow, this is totally my kind of pasta meal!! This is amazing! 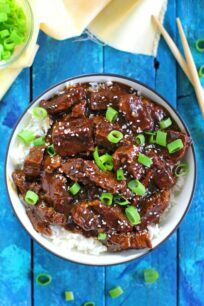 A mix of two of my favorite dishes! I love Barilla! And Mexican pasta?! I have to try this! 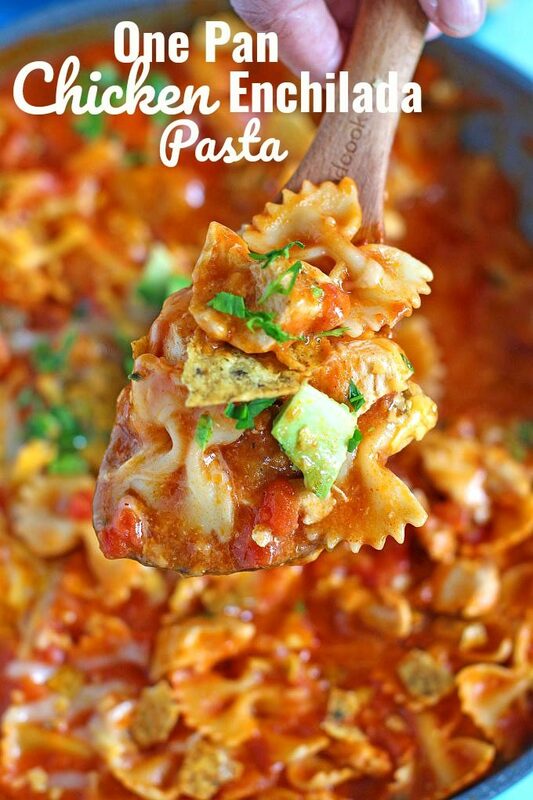 Chicken and pasta dishes are a family favorite!I love the Tex-Mex flavor of this! Great Recipe… I will definitely try this one. I like the nutritional facts for this recipe. Thanks for sharing.